By Jake Rocheleau in Toolkit. Updated on April 24, 2018 . It’s easy enough to create HTML forms but handling user input is a much greater task. If you don’t like coding on the backend this can be solved with FormBucket. 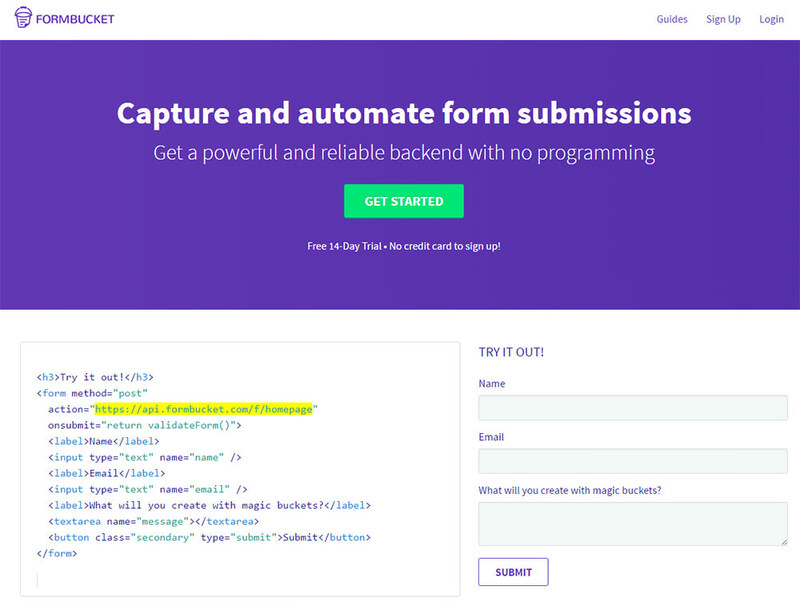 Now, you can build web forms on the frontend while passing all that form data to FormBucket’s backend—no programming required. The site offers a dashboard for storing & searching through all form submissions. Once you create an account, you can make a new bucket for any form. Each bucket handles the processing of a different form where it’ll take all data from text fields, dropdowns, radios, checkboxes and everything else. This data gets sent to FormBucket where it’s curated into your account for easy access. You can also choose to have the information sent to you via email for every message you get. All forms come with spam protection to keep pointless submissions to a minimum. You can filter out any spam submissions that get through using the searchable dashboard as well. You can choose to add one or all of these features to any form you create. All form data still gets submitted to the FormBucket servers where it’s processed and stored in a searchable database. This service does cost money ($7/mo) but FormBucket offers a 14-day free trial for all new accounts. Their comparison page covers the differences between their features and other similar apps so you can see what’s out there. If you’re looking for a simple way to handle web forms then try FormBucket and see what you think. You’ll know within a couple days if you like it or not, and you can always cancel your account anytime so there’s no real harm taking it for a test ride. To learn more, you can make an account on the site or watch their quick one-minute intro video.